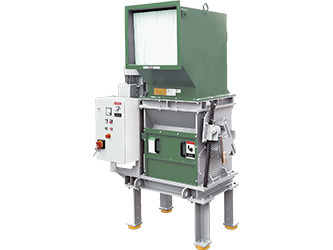 The L series shredders are single shaft shredders with a tangential in-feed to eliminate the need for a hydraulic feeding system. The Space saving and maneuverable design combined with the “plug and play” controls make this machine very flexible and ready to go in no time. Like its bigger brothers in the G series they are equipped with outboard bearings, 310 mm diameter flat E rotors with 600 or 850 mm width driven by an oversized geared motor. Utilizing the proven Virtus knife holder and knife design. The user friendly design makes cleaning and maintenance work a breeze. The low speed of 60 rpm combined with the compact design of the L shredders makes it possible to shred lumps at a relatively low noise level. The machines can be fed manually or by conveyor, material discharge can be done via conveyor or into a drop box. The L shredders have been designed for in house recycling of small lumps and purges, e-waste, medical waste, test lab parts and pieces, as well as a wide variety of biomass, wood and paper. The typical input materials are small and medium sized cakes such as head waste. The material can be shred to reduce the volume or processed further in a granulator to be re introduced into the production process immediately. The machine also can be used to destroy sensitive products or to recycle small batches of low volume products to avoid contamination of the main product line. The L shredders feature an aggressive tangential in-feed for easy feeding without the need for a hydraulic system. Lumps of up to 400 mm diameter can be processed easily in this machine series.